The Solar Model 9354-1 and 9354-2 Transient Generators were especially designed for the performance of a variety of pulse susceptibility tests on subsystems and/or equipment, in accordance with MIL-STD-461E/F, Method CS116; also capable of limited testing for RTCA DO-160D, Section 22. The Model 9354-1 and 9354-2 Transient Generators provide nine selectable waveforms, including six damped sinusoidal pulses (10 kHz, 100 kHz, 1 MHz, 10 MHz, 30 MHz, and 100 MHz) and three double exponential pulses (6.4 µS, 70 µS, 500 µS on Model 9354-1. The Model 9354-2 also has three double exponential pulses (6.4 µS, 70 µS, and 120 µS). Auto pulsing of the sinusoidal repetition rate is internally adjusted from 0.5 to 1.0 pulse per second. A front panel-mounted pushbutton can be used to manually trigger single pulses. 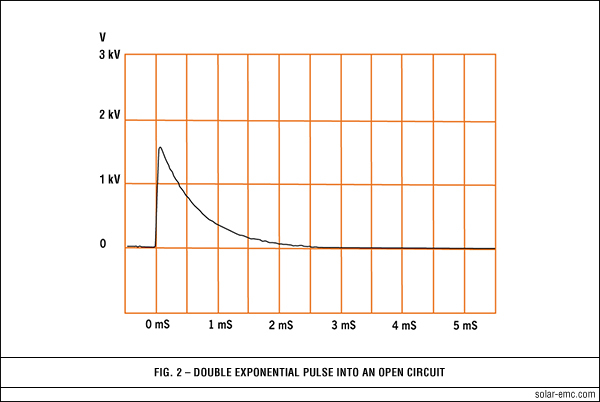 The peak amplitude of the selected output pulse is adjustable as a percentage of the charge voltage. 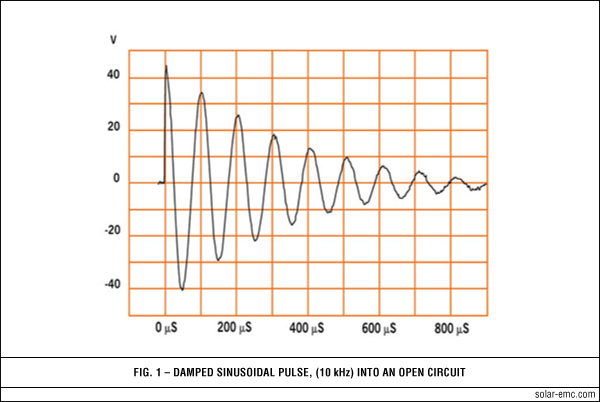 The six damped sinusoidal waveforms were designed to meet the requirements of MIL-STD-461E/F, Method CS116. Continuous tunable frequencies can be obtained by the use of the optional variable frequency modules. The 1 MHz, 10 MHz, and the three double exponential pulses were designed to provide pre-compliance testing of RTCA DO-160D, Section 22. Table 2 lists the test levels that can be achieved from the Models 9354-1 and 9354-2. NOTE: Measurement of short circuit currents are limited by the XL of the circuit. All values are calculated. * NOTE: Waveform 5A available in Model 9354-2 only. Waveform 5B available in Model 9354-1 only. Provide tunable frequencies for injection of damped sinusoidal waveforms from 10 kHz to 100 MHz when used with Model 9354-1 or Model 9354-2. Five individual modules waveforms cover the entire frequency range required by MIL-STD-461E/F. Detailed information is provided on the Solar Type 9554-( ) Variable Frequency Modules page. An inductive injection device that provides voltage and current transfer of 1:1, 1:1.5 and 1:3 voltage step-up (current step-down) as well as 2:1 voltage step-down (current step-up). For maximum power transfer, these ratios are selected by connecting to one of the four BNC connectors. This device, through its various connector ports, provides a better impedance match or power transfer, higher open circuit voltages, or higher short circuit currents. Recommended for cable current injection from 10 kHz to 1 MHz. Detailed information is provided on the Solar Type 9335-2 Multiple Impedance Coupling Clamp. Calibration fixture provides a 50 Ω characteristic impedance based on the dimensions of the Type 9335-2 Coupling Clamp. The fixture maintains a low standing wave ratio from 10 kHz to 100 MHz in a 50 Ω circuit. Recommended for cable current injection from 10 MHz to 100 MHz. Calibration fixture for use with Type 9142-1N Injection Probe. Used to monitor injected pulses of the 10 MHz, 30 MHz and 100 MHz outputs. Provide 40 dB attenuation from 10 kHz to 100 MHz. Protects oscilloscope from high voltage damage when verifying the output pulses of the Model 9354-1 or Model 9354-2. 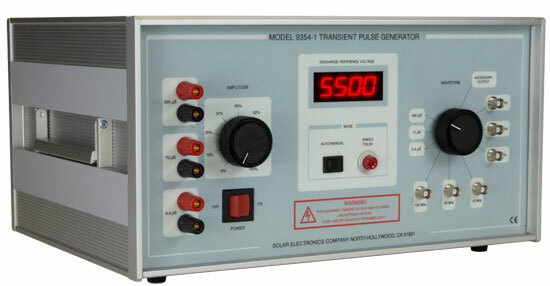 The Solar Type 9454-1 provides a high impedance to the generator for making measurements of open circuit output pulses. When connected in series with the power lead under test, provides twice the open circuit voltage or twice the short circuit current for the 10 kHz and 100 kHz damped sinusoid waves and the 70 µS double exponential pulse. Capable of handling up to 4000 V.
Provides coupling for high voltage pulses produced by Models 9354-1 and Model 9354-2.